Local elected officials joined with developers and transit agency partners today to celebrate the completion of the innovative, $57 million, 110-unit Coliseum Connections residential project. Formerly known as the Coliseum Transit Village, this transit-oriented development provides homes to 110 families, including 55 units designated as affordable for those making 50% to 60% of Average Median Income (AMI). Adjacent to the Coliseum BART Station, the project is a joint venture of UrbanCore Development and the Oakland Economic Development Corporation (OEDC), in partnership with Pacific Housing, Inc. The project sits on a 1.3-acre site secured through a long-term ground lease with BART. While project planning took 17 years, the construction phase was a short 17 months thanks to the use of modular construction techniques. To finance the project, UrbanCore & OEDC used public sector funding from the State ($10 million from the State’s Affordable Housing and Sustainable Communities Program) , County ($2.5 million) and City ($12 million) to leverage private investment dollars, including a $29 million construction loan commitment from Chase Bank, $1.25 million in subordinate debt from Commonwealth Multi-Family Housing Corp., $9.7 million in tax credit equity from the Royal Bank of Canada (RBC), and a $16.5 million permanent loan from HUNT/Freddie Mac. The public-sector funding enabled the large number of affordable units, far exceeding the percentage typically found in privately financed projects. The project is one of the few truly mixed-income residential projects in the State with 50% of the units designated market rate with rents of $2,200 to $2,700 that are affordable for households earning 80% to 120% of AMI, and the other 55 units with rents of $1,100 - $1,570 that are affordable for families earning 50% to 60% of AMI. The units are co-mingled creating one community of mixed-income levels. The project is truly unique in that the developers, together with architects Pyatok Architects and Prefab Logistics, and general contractor Cahill Contractors constructed the building using modular technology to speed construction and reduce costs. The fabricator for the modular units was Guerdon Modular Builders from Idaho. The developers estimate that the use of modular units shortened the construction schedule by five months, and saved about $4 million in construction costs. The project consists of a five-story building (Building A) fronting Snell Street at the corner of 71st Avenue accommodating 66 one- and two-bedroom flats. The 44 two-story townhome units are on the eastern portion of the site grouped in three separate buildings. A partially below-grade structure provides 86 residential parking spaces, including three electric car spaces. Perimeter townhouse units are setback 10 feet from 70th and 71st streets with shared entry stoops connecting to the sidewalk level. A community cafe space for residents is located at sidewalk level adjacent to the primary building entry at the south end of Building A. A community room for residents’ use is just off the lobby and open space for the residential units is provided at the podium level in a combination of private patios and shared outdoor areas. and 70th streets, providing neighbors with a direct walking and biking path to the Coliseum BART Station. Bio-swales located at the pedestrian mews and along the frontages of 70th, 71st and Snell provide management of storm-water runoff. 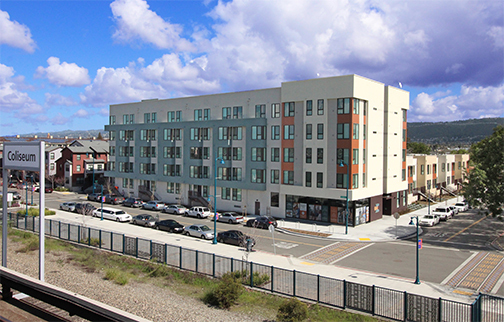 Residents at Coliseum Connections have exceptional access to BART’s rail system, numerous AC Transit bus routes, Amtrak’s Capitol Corridor Line and the Oakland Airport Connector, all complemented by recent streetscape improvements. The building exterior is contemporary in character, with a strong “billboard” element facing the BART line, and sheltering the lower scale “village” of two-story townhomes. Exterior materials include a mix of flat-troweled cement plaster, hardi-board siding and metal panels, and self-recessed windows. The base at the primary building entry on 71st is clad in vertical wood siding between tall storefront glazing. The color choices reinforce the eclectic neighborhood and cultural context. The result is a high-quality building that underscores the importance of this pioneering investment at the Coliseum BART Station area. High-resolution files of an interior and exterior photo are available at: https://www.dropbox.com/sh/m3b5jq0gobsqghc/AAANuWT1vVhER0AC8NsPz-96a?dl=0.